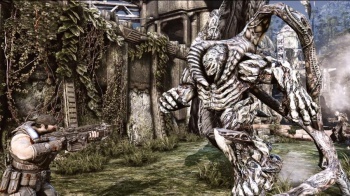 Fenix Rising will bring five multiplayer maps, skins and new experience options with exclusive rewards to Gears of War 3. Fenix Rising looks set to bring an impressive mix of new content to Gears of War 3, including five new multiplayer maps "inspired by significant locales" in the game: "Academy," where generations of Seran military officers were trained but which is now overrun by the Locust Horde; "Anvil," the ruined shell of the fortress of Anvegad, where Marcus went to find Hoffman; "Depths," featuring the underwater opulence of Azura; "Escalation," built around Haldane Hall, the generational home of the Fenix family, ruined by war; and "The Slab," otherwise known as the brutal Jacinto Maximum Security Prison. The map pack will also add four new skins to the game - Recruit Clayton, Thrashball Cole, Savage Marauder and Savage Kantus - and, perhaps most interesting of all, the option for players who reach level 100 to "re-up," which will reset experience and rank but leave everything else, including "TrueSkill" rating, intact. Gamers will be able to re-up three times, earning new rank color icons - red, green and gold - and exclusive weapon skins. Fenix Rising will be available on January 17 for 800 Microsoft Points and can also be had as part of the Gears of War 3 Season Pass, which includes all previously released Gears 3 add-ons, for 2400 MS Points.